By now you have probably heard about the bug plague infestation brief and insignificant appearance. Ok, not every last stinking one of them, but pretty much. The swarms have dried up and blown away. People are working unmolested. Nature has run its course. 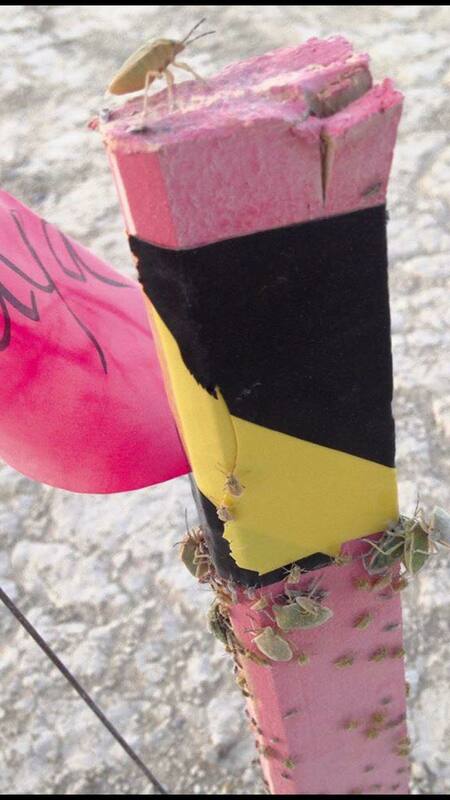 Yes, it was true, unknown bugs of mysterious origin showed up by the thousands or millions in Black Rock City over the past week, but the heat and the dryness have taken their toll. Larger insects came along, too, and there were plenty of smaller bugs for them to eat. Yesterday morning, we saw a small flock of birds down by the Depot, no doubt drawn to the area by the plentiful insect diet. Please, though: The birds were not massing in Hitchcock-ian numbers. They did not line the trash fence, nor did they swoop and dive on us as we entered the commissary. I’m sure many Burners will be relieved. But should we believe John Curley? Because a couple of days ago, the Voices of Burning Man was saying he does not officially speak for them. In the three and a half years I have been writing this blog, I am used to reporting on wild exaggerations made at BurningMan.com and parroted around the world without thought by the mainstream media. Our usual response is to provide evidence of the truth, which then draws out the online borg army to character assassinate us for lies half-truths sensationalized headlines. This story is the reverse. On Wednesday, we had a live update from the Playa, complete with photos, on burningman.com. This story was picked up by media all over the world. Burning Man’s corporate communications team had to intervene to downplay the situation. And then the original author himself has come out to say that the drama’s over. Was this all just an epic troll? Part of the Carnival of Smoke and Mirrors, tricking the suckers and chumps and rubes? If so I tip my hat to Mr Curley. Nice job sir. Medium – They Stink! They Bite! I believe in the power of an almighty God who is both just and terrible in his wrath: America’s least favorite gathering of startup dorks on MDMA is swarming with a plague of nightmarish, biting bugs. Tech Times – Burning Man Bugs Stink And Bite: What Are They? We don’t know how the little critters survive in the heat and the sun. All we know is that if you pick up some wood, you’re likely to uncover hundreds or thousands of the things. They’ve blown up inches deep against the sides of the Commissary tent. They’ve covered the carpets at the Depot. They’re all over the Man Base. So it’s not a localized occurrence, it’s everywhere. If you’ve been keeping up on the latest rumors flying around the internet, people are in a bit of a frenzy about an alleged bug infestation of plague-level proportions on the Black Rock Desert this year. We understand the eagerness to swarm around this click-worthy story, as the media most certainly has. We’re here to dispel the rumors (bless you, internet), provide some facts, and hopefully calm some nerves. So are there bugs in Black Rock City? Yes. Due to unseasonably wet weather, the grass on the hills is unusually verdant, and that’s resulted in more bugs showing up in the desert than usual. There are green beetles called stink bugs (so-called because they emit a coriander-like odor when disturbed), mosquitos, and gnat-like seed bugs called Nysius. One entomologist reports that they might be causing skin irritations not because they’re biting, but because they’ve likely been eating mustard seed, which has been proliferating in the region recently, and the mustard oil irritates the skin when the bugs are smashed. But despite the rampant rumors, these bugs are more of a mild nuisance than a full-blown infestation that should cause any major concern with Burning Man participants. We’re hoping that continuing hot weather and a huge swarm of Burners descending upon their Black Rock Desert home sends them packing before long, but we can’t say for sure that’ll happen. And then the next day: “no no no, there aren’t any bugs”. Most of the outlets used quotes just plain lifted from the blog. This was supplemented with Twitter posts and pictures. There was little, if any, additional reporting. Most of the outlets also used the photos we posted here, without asking permission (those that did ask were denied, according to Communications Director Megan Miller). By the way, the photos are copyrighted, with rights jointly held by me and the Burning Man organization. We’d be assembling a legal team if we didn’t already know that the normal and customary fees for what would likely be called “freelance submissions” range all the way from nothing to about fifty or a hundred bucks. You don’t get the big money doing journalism. So what the hell. It’s fine. It was a good story and lots of fun, even if it did throw a scare into people. It wouldn’t be the first time that’s happened. They object to the journalists not contacting them to do additional reporting, while at the same time admit that if the journalists DID contact them, permission would have been denied. Most of the stories linked above used images from Twitter, it’s not clear how BMOrg can stake an ownership claim on those. The Bugpocalypse drew an amusing response from the Burner community. IT’S A DAMN SIGN FROM GOD!! 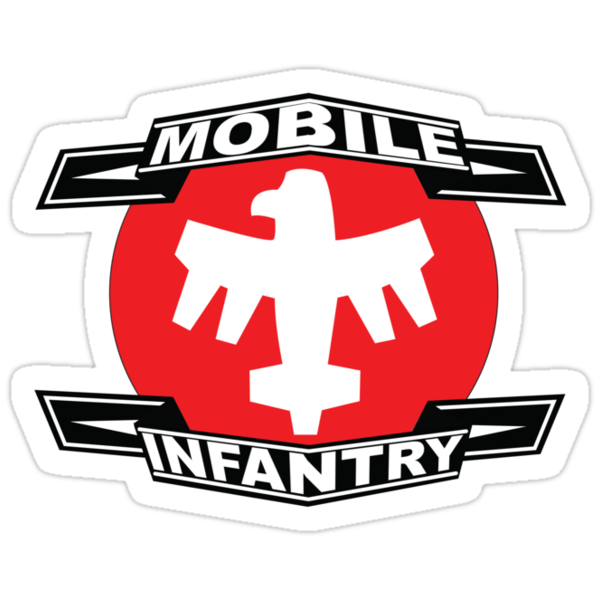 Join the Mobile Infantry Camp! FREE TICKETS FOR ALL CITIZENS! !